Just got back from a night out with girlfriends. My very good friend is leaving us to go work in another city. No more breaks and lunch's with her, wah. So tonight we gave her a send off at one of her favorite food places, Mexican. Since there was no decorating involved, I of course couldn't not do anything party related. 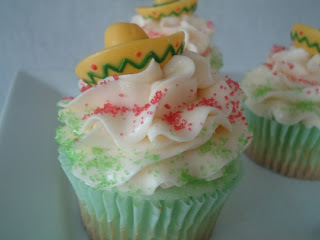 So I made mini cupcakes to match the food choice... Margarita cupcakes! They turned out really good. 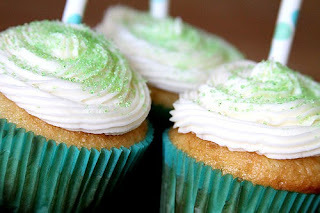 Margarita mix in the cupcake, lime juice, coarse salt and tequila in the frosting, YUM!! I gave these some consideration but I'm not a fan of beer so I went with the margarita. I might make these for my man though since he likes Corona. 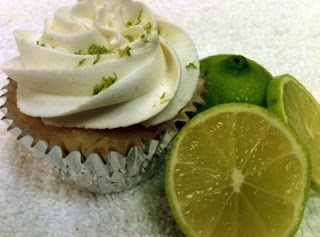 Corona lime cupcakes. Wow! How did I miss this comment. Thank you for leaving some Love Dawn :D I really enjoy reading all the comments. If you made them I hope everyone in your little town of Barrow loved them.